Grandmaster Jae Joon Kim was born on August 15, 1929 in Seoul, Korea. Grandmaster Kim’s father, Dong Hwan Kim was a full-time merchant and a part-time Sumo wrestler, who had trained in Japan and won the Korean Sumo Championships. An avid sportsman and athlete, Dong Hwan Kim wanted his son to master a “manly” sport and in 1945, enrolled his son in a Western-style boxing club. Jae Joon Kim was a good student, winning eleven of his fifteen bouts on the Korean amateur circuit. While studying Sumo in Japan, Dong Hwan Kim witnessed karate training and had been impressed by what he observed. He then decided to end his son’s boxing career and in April of 1945, enrolled his son in Grandmaster Hwang Kee’s Tang Soo Do Moo Duk Kwan Dojang in Seoul, Korea. Grandmaster Kim became a devoted and gifted student of Tang Soo Do under Grandmaster Hwang Kee earning his black belt (MDK Dan Bon #38) in 1947 at the third Moo Duk Kwan promotion test. Grandmaster Hwang Kee’s training was rigorous and sometimes brutal and he required hard body conditioning through constant repetition. Under his tutelage, students punched and kicked the Tal yun bong (makiwara) 100 times a day with each hand and foot, often leaving the board stained with blood. All students had Tal yun bong in their homes and Grandmaster Kim had two, often staying up smashing the board well past midnight. In 1955 Grandmaster Kim gave an exhibition at the 1st International Goodwill Tang Soo Do Tournament. During 1967 and 1968 he was awarded the 8th Dan and appointed president of the Moo Duk Kwan in the United States by Grandmaster Hwang Kee. In 1969, he formed the American Moo Duk Kwan Tang Soo Do Federation in Detroit, Michigan. With the success of his federation, Grandmaster Kim moved the federation’s headquarters to Brandon, Florida in 1987 and renamed it the World Moo Duk Kwan Tang Soo Do Federation. On April 7, 1990, in recognition of his worldwide promotion of the Korean martial arts, the Kukkiwon promoted Grandmaster Kim to 9th degree black belt (#01000025). He was later promoted to 10th dan in Tang Soo Do by the World Tang Soo Do General Federation Moo Duk Kwan in Seoul, Korea. 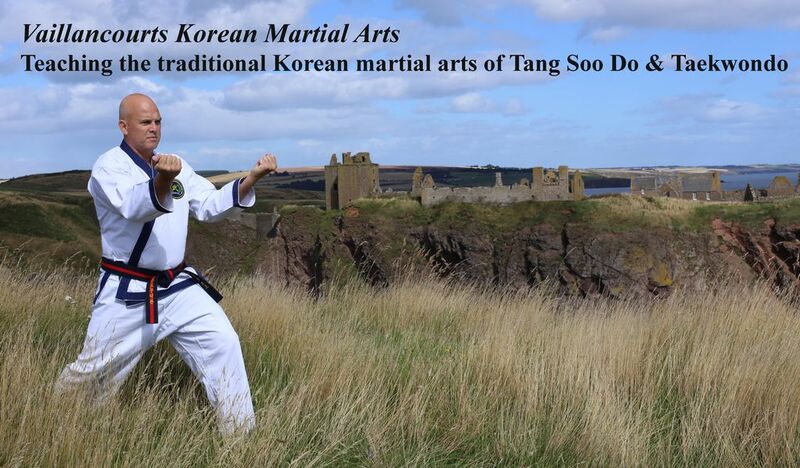 Through the years, Grandmaster Kim has selflessly promoted Tang Soo So throughout the world and has trained Master Instructors in the United States, Europe, Asia, North and South America and South Africa. His selfless contributions to the community have resulted in numerous proclamations from mayors around the country. In 2004, Grandmaster J.J. Kim was inducted into the Tae Kwon Do Times Hall of Fame. On April 22, 2006, Grandmaster Kim was inducted into the Taekwondo Grandmasters Society Hall of Fame. For over 50 years Grandmaster Kim had been a devoted teacher and inspiration to all who come in contact with him. Grandmaster Kim passed away suddenly from cancer on January 9, 2007. The world’s martial art community considered Grandmaster Jae Joon Kim a Master’s Master. The Vaillancourts are honored to have had him as an instructor. Some information is from the World Moo Duk Kwan Tang Soo Do Federation’s Tang Soo Do Martial Arts Student’s Manual. Mary Ellen Vaillancourt trained in the Korean martial arts since the late-1970’s and held the ranks of 5th dan in Tang Soo Do and a 5th dan in Taekwondo. All of Mrs. Vaillancourts Tang Soo Do ranks were received from Mr. Dana Vaillancourt andr their late instructor, Grandmaster Jae Joon Kim. Ms. Vaillancourt was an Executive Committee member with the World Moo Duk Kwan Tang Soo Do Federation (WMDKTSDF), a WMDKTSDF master instructor and received several Letters of Commendation and Certificates of Appreciation from Grandmaster Jae Joon Kim. Ms. Vaillancourt was selected to be in the Third Edition of Who’s Who in American Martial Arts and received a Recognition Award from TaeKwonDo Times magazine in 1992. She also held Taekwondo dan rank from the Kukkiwon and was a certified instructor with the Vaillancourts Korean Martial Arts curriculum. A long-time teacher, she previously had her own Dojang (Belle Fourche, SD) and had promoted numerous students to dan rank. Mrs. Vaillancourt fought a courageous 6 and 1/2 year battle with three different primary cancers and continued to train and teach whenever possible. Vaillancourt's Korean Martial Arts mourns the loss of a valued teacher and Mr. Vaillancourt's best friend and spouse of 33 years.